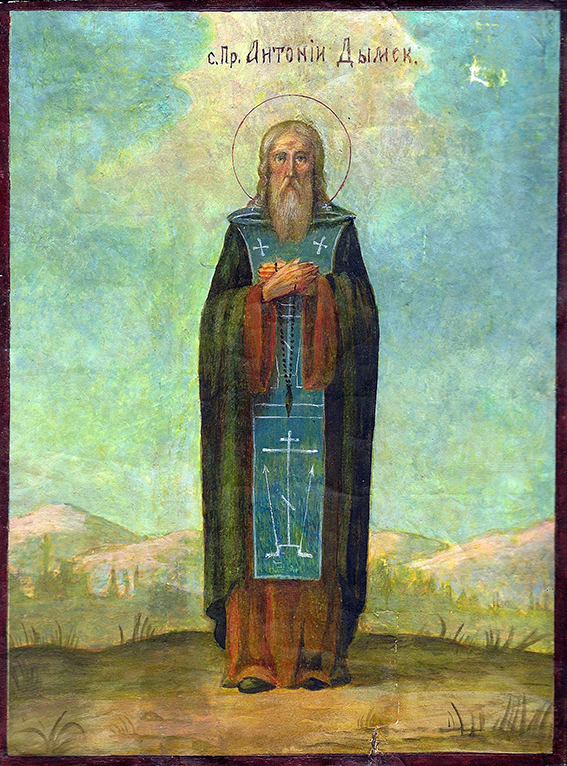 Venerable Anthony of Dymsk was born at Novgorod in about the year 1157. He would attend church daily in his youth, standing away from people to concentrate more on his prayers. Once in church he heard the words of Christ: “If anyone would come after Me, let him deny himself and take up his cross and follow Me” (Mt. 16:24), the Saint resolved to leave the world and receive monastic tonsure under Saint Barlaam of Khutyn (Nov. 6) at his Khutyn Monastery in Novgorod. Here he surpassed everyone in ascetic exploits and obedience. His astounding humility and strict abstinence gained him general trust and love. 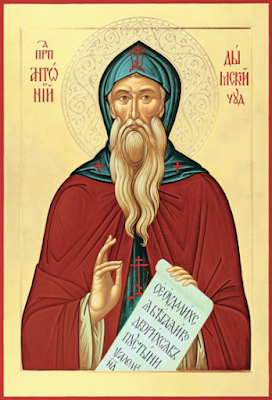 According to tradition, Saint Anthony made a journey to Constantinople to Patriarch Athanasios, and returned to his monastery five years later on the day that the abbot Barlaam died. 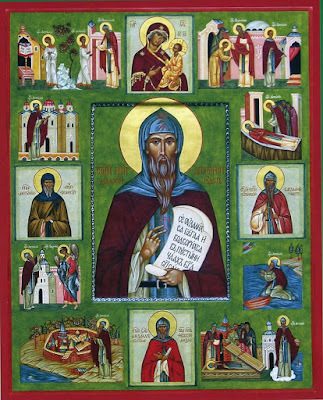 When he was dying, Saint Barlaam appointed Saint Anthony as abbot in his place; but soon after Anthony, shunning glory, left the monastery and settled in a cave at the shores of Lake Dyma, on the outskirts of the city of Tikhvin. In the middle of Lake Dyma, the monk Anthony discovered a large stone, the top of which was barely visible from the water. Depending on the water level in the lake, the stone would go under the water, then again appeared on the surface. Anthony took a boat to the stone, and for long hours and nights he prayed alone, standing on this stone. Venerable Anthony is the only saint of the Russian Orthodox Church who accomplished the feat of stylitism on the waters. This stone is still preserved and is located a few dozen meters from the coast (usually hidden under water), and in 1994 a wooden cross was erected a meter from the stone. The fame of the exploits of the Saint soon spread, and many people began to gather there. With the permission of Grand Duke Alexander Nevsky in 1243, on the shores of Lake Dyma, a monastery was founded in honor of Saint Anthony the Great (known as Saint Anthony-Dymsk Monastery), and Anthony became its abbot. He struggled there until the end of his life. For more exhaustion of his flesh, he constantly wore an iron hat on his head. The broad brim of the hat was nailed to the crown with thick nails that pressed the ascetic on the head. 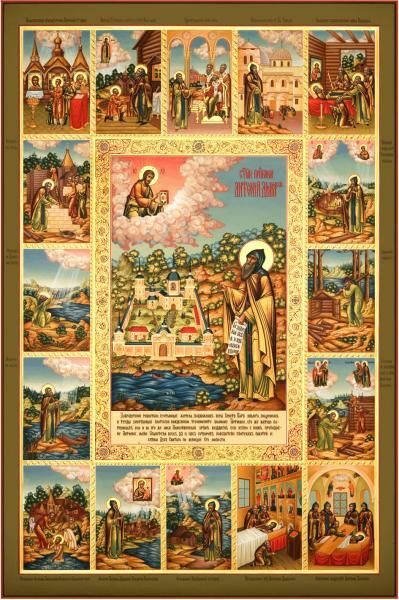 So through patience and physical suffering, the monk Anthony cleansed his soul for eternal life. Saint Anthony fell asleep in the Lord on June 24, 1224. In the year 1330 his relics were found incorrupt, and from that time they were glorified by many miracles. 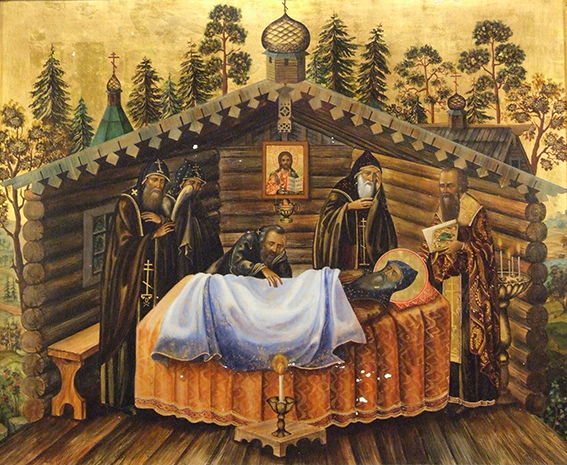 Many who were sick received healing from laying their head on his iron hat and from venerating the tomb over the holy relics of the venerable Anthony. In 1370, his relics were found, which were enshrined in the temple openly before the invasion of the Tatars in 1409, when the brethren, hiding them from desecration, hid them in the ground. The monastery was devastated as early as 1611 by the Swedes. In 1744, over the place of the concealment of the holy relics, a Petersburg merchant named Kalitin was healed by Saint Anthony from a long, serious illness, and he had a wooden gilded tomb built. 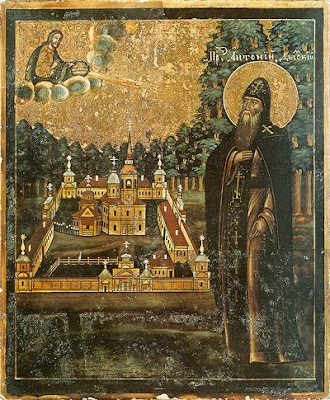 From 1794, the monastery founded by Saint Anthony became known as Holy Trinity Antoniev-Dymsk Monastery. 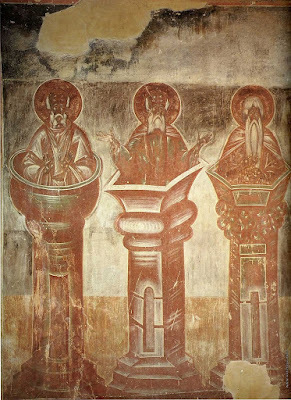 In 2001, the relics of Saint Anthony were found a second time and transferred to the Tikhvin Monastery of the Theotokos. 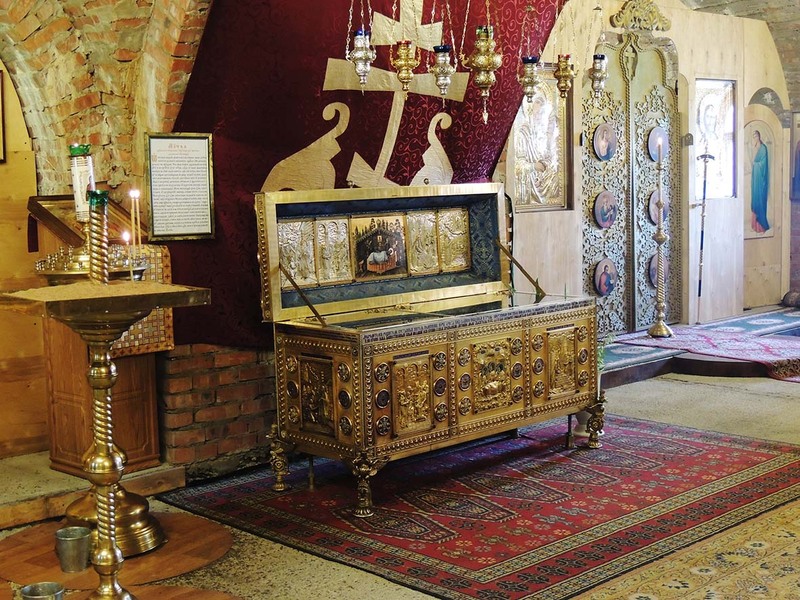 In 2008, the relics of Saint Anthony were returned to the Saint Anthony-Dymsk Monastery. His primary feast day is June 24th, and is also commemorated on January 17th in honor of Saint Anthony the Great.